Light Emitting Diode (LED) bulbs. LEDs can last up to 10 times longer than CFLs, and far longer than typical incandescent bulbs. Halogen lamps waste 90% of the energy they consume by turning it into heat not light. Built-up dirt and dust on light bulbs and fittings can account for a light reduction of up to 50%. Make sure you have a regular cleaning schedule in place for lamps and other light fittings. LED tube lights are available to replace standard fluorescent bulbs. 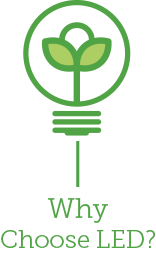 Available in 8 and 16 watts, they replace 25- and 40-watt T18, T10, and T12 fluorescent bulbs. This store, part of a national franchise group, is based in a major Westfield centre in Brisbane. The owner provided a copy of the last period power account as part of our audit process so we could assess the actual power consumption and have a starting point to determine the savings LED lighting would provide. The account shows that for 12 months the cost of power was $6000.00. This did not include the replacement bulbs that failed in the year and 2 complete fittings failed in the same time. The real cost for the year worked out to be $6500. The store is approximately 100 sq. metres and had 43 (150watt) metal halide lights which contributed to almost 100% of the power bill. The replacement of these 150 watt lights with 43, 38watt LED lights will reduce the power running cost to approx $1200. This is simply worked out by multiplying the wattage of the LED’s against the wattage of the metal halide lights. This is a straight off the top, cost saving of just under 75%. As the LED’s do not generate the same heat load, the air conditioning functions more efficiently. With many customers in the store at any one time, makes their experience more comfortable and relaxing. With the capital cost of installing the 43 LED lights being approx $4800, the new LED system cost is recovered in the first year. This is from the savings made with the reduction of the power bills submitted by Westfield based on current pricing. As power prices continue to increase, the savings over the years ahead just get better and better. Click here for a ceiling plan showing light positions. In conclusion, it is evident that by changing all fittings to LED’s you can begin the process of saving money from day one. Furthermore, because our LED Lights carry the full manufacturer’s warranty for 5 years (or 50,000 hours), no bulbs will have to be replaced during this period at the owners cost, so these savings of around $5000 per year go straight to the bottom line. Great result! The owner provided a copy of a power account from 3 years ago in 2010, during our early process of auditing the power usage, and one from the most recent billing period following the installation of a range of LED lights. It was clear that by replacing bulbs that ran at 30 to 60 watts each, with LED’s that ran between 3 and 7 watts each, the savings would be worth the investment. The accounts show that the actual real costs of the power used is the same now as it was in 2010. Given the significant rises in the charge rates for electricity over the last 3 years it was the single most important decision the family made in reducing their costs and at the same time, doing something for the environment. It is not often you can contribute positively to the planet and it saves you money at the same time. Not all lights were changed over due to budget limitations; however the lights in the main rooms and around the entertaining areas internally and externally were changed to LED’s. The room lights that have been left as they were had typically 38watt halogen 12 volt fittings and CFL bulbs. No incandescent bulbs are in the home at all now. Given the power charge rises in recent times, it is clear the savings have been made just from the efficiency of the LED lighting in the key rooms. If you are technically minded, the attached document is a PMon (Power Monitoring) measuring system report which measures the power used on circuits. This was installed in at Stretton Aged Care showing the power used up to the 14th November 2013 with low voltage CFL lights. From the 15th November 2013 the same power is recorded using 9watt LED corn lights and it is shown to be half the power used with no loss of light concentration. The client is very happy and this will now roll out to the other centres over the next two years. Install sensors or timers to ensure lights are on only when you are using a particular area. Take advantage of natural light to reduce your need for artificial lighting—open blinds, move objects that block light, and keep your windows clean and clear. Installing a skylight can increase the natural light in your workspace, and even reduce your heating and cooling costs. When switching your light bulbs over to LEDs, remember to switch over the bulbs in your building’s EXIT signage as well. Turn off all the lights after hours and on weekends. Remind your staff: last one out turns off the lights! This goes for showroom and display lights too. If you’ll be away from a room for more than 10 minutes, remember to turn off the lights, and encourage your staff to turn lights out when they are no longer using a particular area. You may even like to put up easy-to-read reminder signs around light switches and doors. Consider installing lighting controls like occupancy and light sensors, dimmers and other well-designed controls, which can help you reduce the energy you use on lighting by up to 80%.